After struggling alone for years with the guilt, shame and remorse of my involvement with my girlfriend's decision to abort our child I finally found a ministry that recognized my need to get help. Rachel's Vineyard provided a place where I could voice my pain and guilt amongst others who validated my emotional response to a very difficult experience. The acceptance of the women there was especially helpful because I felt I had hurt my girlfriend so badly that all women would despise me if they knew what I had done. Their understanding and acceptance helped me to move a little further in forgiving myself and in being able to love others in my life in a deeper way. My current wife and daughter benefited from my willingness to deal with this deep secret of my past. I thank Rachel's Vineyard for allowing the unconditional love and acceptance to be present that was needed for me to release the pain that was hindering my relationships in the present. The couple that came had been to marriage counseling in the past (they gave me permission to share with you and others their story). They had separated several times; each had had affairs during their shaky marriage. The marriage was still on shaky ground when they came. Emotionally they remained distant because of the pain. One of the only reasons they stayed together was because of their children, born after the abortion. Their shared Christian faith also helped them continue to struggle to stay together. They came to the realization that it wasn't so much a marriage problem between them as it was an abortion problem. They came to RV, admitting that they do have love for one another, but didn't know how to get past the barrier that abortion brought to their lives. Not knowing how to love anymore. As they put it, "We're empty." And so they came to our retreat. The husband said of his rock, "I've been carrying this rock for 14 years. I've been emotionally dead for that long. I throw myself into my work, which alienates me from my wife, and it causes her to be angry, but I don't know what else to do. She has had some post-abortion help, but I don't know how to heal. We don't know how to heal our marriage. Another thing the husband said is that since the abortion he never knew who he was as husband and provider. He never knew what he was supposed to be and to do so he threw himself into his work. He said his identity-who he was- was all taken from him and he never felt whole...never felt he was, who he was supposed to be since the abortion. He said, I know I was never there for her during the pregnancy, I accept my part of the responsibility, I know she made the final decision because of me and our shaky relationship (he was in the service at the time), but that was the day I died. I've been dead for 14 years. During the Lazarus exercise, something beautiful happened. When the team came to wrap a part of their body they had chosen, the wife decided to have her left hand wrapped. She said, "This is the hand that my wedding ring is on, and I want to see our marriage restored". He said, "You have to wrap my heart . . . it is just broken. 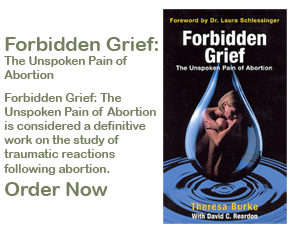 It's been broken ever since I got the call that the abortion was over and my child was gone". So we wrapped accordingly. After prayer, when we got around to the unwrapping, two of the team went to the wife to unwrap her hand and her husband stopped them, and said, "No, no, please, let me do it -- I think this is my place as her husband. I want a partnership to begin that we never have had. I want to be there for her, not so distant any more." And so, he unwrapped her hand. She, in turn, unwrapped his heart and asked forgiveness for her bitterness toward him. They then embraced for about 5 long minutes. To see the husband keep drawing his wife close to him after the Lazarus exercise, was such a heart blessing. They began to hold hands as they walked the long horse-trail to our "Mess hall" for meals. Those of us walking behind them couldn't help but smile. We all realized that he took back that which was taken from him as he unwrapped his wife's hand . . . he was taking back his vocation of being the provider and protector of his wife. And, as we all know, that is a miracle only God can work. I was just glad to be there to see it! And his wife was thrilled too. She said that she was feeling secure in his love, and protected, and loved. She was enjoying the closeness. by Jason Bair, Founder and President of Fatherhood Forever, Inc.
Over the last decade, I've worked very hard to recover from my abortion experience. I've done just about everything there is to do starting with visits to a psychiatrist and a counselor, spending time in the hospital, and taking all sorts of anti-depressants and other medications. When those things didn't work, I then turned to "alternative means" by first finding a church, then participating in a 12-step program and various support groups, reading books relating to my problems, delving into bible studies, and taking time each day to pray. Last year I determined I was healed and started Fatherhood Forever to help others find hope and healing as I had. Since then I've met so many wonderful people in pro-life and post-abortive ministries. I've had the privilege of helping others on their path to healing. I've been honored to share my story before groups of pro-lifers, churches, youth and the general public. In February I had the opportunity to attend a Rachel's Vineyard weekend retreat. I attended the retreat on the basis that I would learn more about this ministry listed in our Men's Recovery Network and to see if it was something I'd be interested in helping with. My sole purpose for attending was to conduct "research." Little did I realize what I had gotten myself into. When I arrived at the retreat, I put on a big smile and acted as though I had no concerns about what would happen during the weekend. I'll admit I was a bit nervous, but couldn't put my finger on the reason why. I was relieved to discover I wasn't the only guy that would be attending. The retreat location was absolutely beautiful and I was soon at ease with the whole idea of spending the weekend there. That is until the retreat officially started. Within minutes of starting, I found myself putting up barriers. I become stone-faced and sat with my arms crossed in defiance, attempting to resist any emotion the staff might be trying to pull from me. "I'm already healed," I thought to myself. "There's nothing they can do or say to make me think otherwise." My pride got the best of me to the point that I felt compelled to express my "discomfort" with one of the staff members during a break. Her simple words of comfort and understanding quickly put me at ease. When I went to bed that night, I told myself that although I was going to be strong, I would at least be more open tomorrow. And then tomorrow arrived. So much for strong. I cam to realize that I still had a great deal of unresolved anger toward the mother of my child, who I thought I had forgiven, and guilt for not being able to prevent the abortion. But my emotional breaking point was when I discovered I still had sorrow and despair buried deep within my heart. I hadn't cried that had since the day I told my child. I cried not only for the loss of my child, but for having fooled myself into believing I was healed. I was angry and ashamed with myself. It was at my lowest point of the weekend that nothing short of a miracle occurred. I was suddenly overcome with a sense of peace that I had only experienced once before in my life. I embraced these emotions and let all my pain and anger go. For the first time ever, I was able to see clearly and know that I had reason to be happy rather than mourn. I was able to put to rest all those thoughts and feelings that were holding me back from being the person I was meant to be. My eyes were fully opened. Since the retreat, I've had new revelations and convictions that have paved the way for a brighter future. I've discovered truths I had been blind to in the past which have raised me up in faith and hope. February has always been a difficult month for me, but this year instead of grieving over my loss, I rejoiced in what I had gained. If you are post-abortive, I whole heartedly encourage you to attend a Rachel's Vineyard retreat. There's so much to be gained from it.